The 2 myths I will be talking about is that cross processing E6 slide film in standard C41 colour negative gives unpredictable hence random results. Hence the popularity with lomography crowd. Before you stop me I know plenty of people that take wonderful dreamy shots with lomo and other toy camera but none of them rely on random luck it's skill and artistic ability. 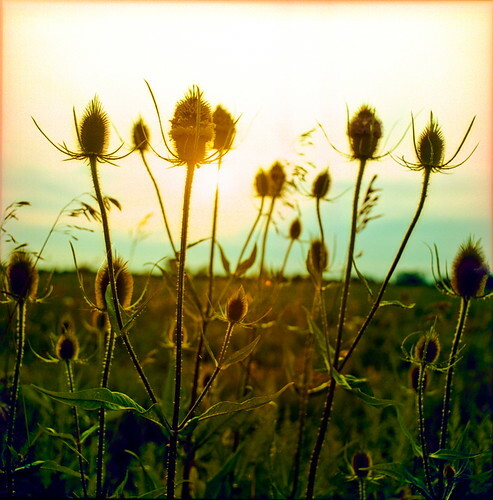 Second lesser myth is that it is better to over expose expired slide film when you cross process. Slide film in general has a much smaller latitude when compared to negative film this means that your exposure settings for slide film has to be more accurate then with negative film or your highlights will be blown out (sort of sound like digital doesn't it) on the other hand if you under expose the darks will be one shade of black. With todays colour film a couple of stops under or over exposure doesn't make much difference it will look pretty much the same. Film records light in a nonlinear way so instead of clipping like in digital the highlights and shadows are compressed in a natural eye response type of way. Film Contrast by Perry Sprawls, Ph.D.
Film is not like fine wine it's designed to be used when it is still young. As film ages it gets bombarded with cosmic rays and maybe more important the layers oxidize and chemicals diffuse and mix with each other sort of like the ripples in hundred year old glass windows. Refrigeration or freezer will extend the life but only by so much. As the film ages the unexposed film slowly fogs meaning black is no longer black but shades of grey. The colours in the dark areas become muddy and the grains of silver become more obvious and dyes start to bleed. (This paragraph is conjecture and observation on my part.) Astronomer super charge film sensitivity to low light by annealing it with special gas mixtures). The lower the ISO the slower the film ages (this shouldn't surprise anyone). What sort of surprised me was that expired film seemed to be fairly constant in exposure (ISO), with only the latitude and dynamic range decreased by the level of fogging. Now what does this all mean when it comes to exposure. Conventional wisdom seems to be to over expose to compensate for the fogging. I have tried this by a half a stop for 15 year old slide film and all I did was sacrifice the highlights for a bit better shadows, I also tried over exposing by 1 stop and pulling the development by one stop, this was even worse, colour film in c41 seems to push better then it pulls. My best results is to shoot at box speed and meter the exposure for the subject of importance. It also saves me the time money at the lab as most lab charge extra for pushing, pulling and cross processing if they can even really do the pulling correctly. So shoot at box speed and meter for the subject, it's old film what do you expect new film? I'm only talking about colour slide film it's different for B&W and negative film. The big myth that cross processing gives random inconsistent results. Except for the occasional very rare damaged roll. I find the result from each type of film is repeatable and consistent. 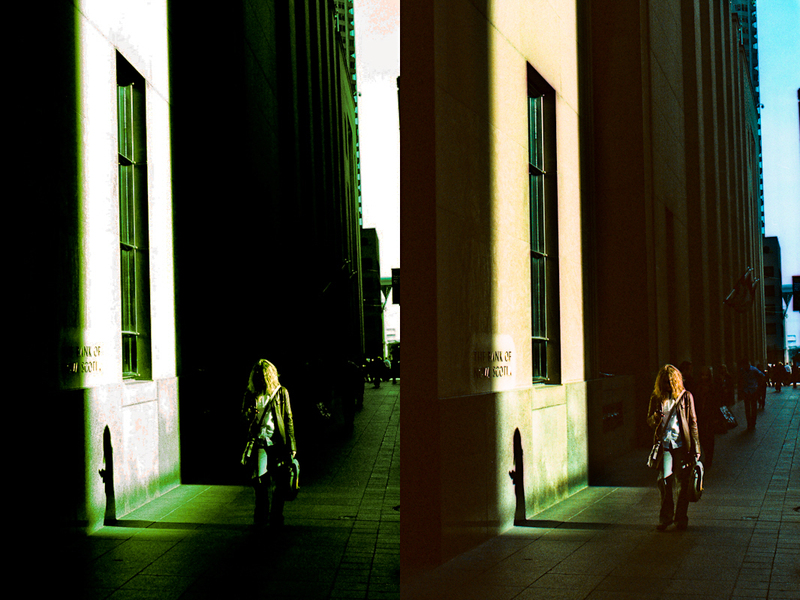 When I first tried cross processing I didn't really know why the results appeared to be inconsistent. I believed all the myths. First I thought it was how it was developed, then how it was exposed. A couple of years ago I started to examine the colour curves. I couldn't make any sense out of them so I thought it was cross talk between the RGB channels red getting into the green channel, blue into red, ... sort of like the current lomo fad (ducks) using redshft film to shift the colours into the yellow orange red spectrum. So I tied to build a colour profile that would correct this cross talk, no such luck. it wasn't until a lab scanned the cross processed as colour positives effectively supplying me with colour negatives (excuse the brain twisting double negatives). Examining the colour negatives curves it was plain to see that the rgb curves had a much different shape then normal and the centre of symmetry was offset and different shaped for each of the rgb channels when compared to a normal colour negative curve. That colour is dependent on and intertwined with intensity. If you remove this dependency you get consistent slide to slide, roll to roll results. If you let a lab scan your film you will get highly inconsistent results that depend how their automated scanner treats a cross processed image when expecting a normal colour negative.. If you want a consistent results you have to adjust every image at either at the scanning stage and/or in post. Usually it's enough to correct white balance at 1/3, 2/3 and %100 white. The goal is not to get perfect white balance, if that was the target then why bother cross processing. Whats with the ABCD in the above polytch using the same negative Kodak 64T expired 1997. A is lab scan not too bad except for the blown highlights and lack of shadow detail. B is scanning as a colour negative, good details an colours but hard to get the highlights as tungsten balance film has a tendency to have a lot of red noise in the highlights, this can be used to good effect to give a gold look. C Scanned to give the expected digital cross processed look. 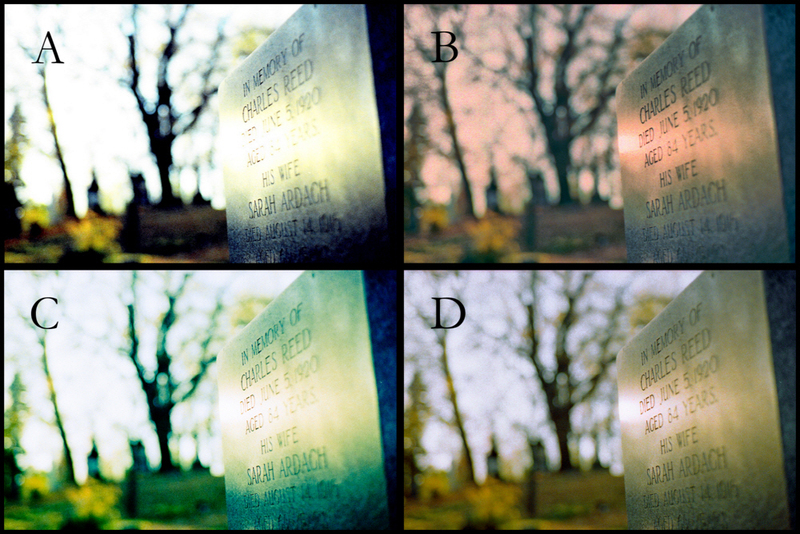 D is scanned as a colour positive and then colour reversed in post. This gives you the most control at the expense of extra time. Note: Scans B,C and D were done on my Epson V500 scanner. I cross process because I have cheap expired slide film and I like the surreal colour shifts even if it is at the expense of some colour bleed and lose of details. I really like Kodak Kodak Ektachrome tungsten balanced film is my favourite film to crossprocess because I can bring out golden highlights. 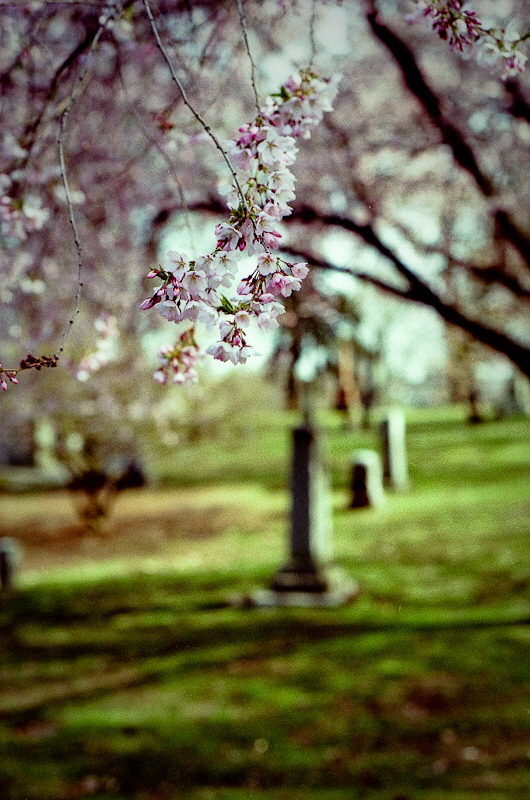 This expired Fuji Provia 100f is not too bad it still has a good DMAX - DMIN. But of course with all expired film it has lost some shadow detail. By now you should be able to guess which scan is the v500. Cross processed Fuji Velvia 50 scanned as positive and then reversed by colour negation in post. 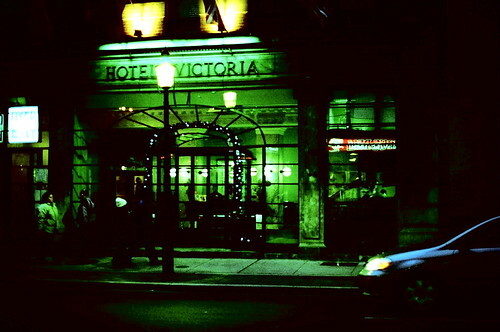 Velvia 50 is very difficult to scan directly as a negative because the DMAX-DMIN (dynamic range) of the film is so high. Thanks for your blog post it was exactly what I was looking for, however, I missed one thing. How did you scan C? This is just what I wanted! C is scanned as a negative same as (B) but I purposely tweaked the green to give it a more conventional cross processing look. Thanks Ryan, I found that scanning my slides as positive film and then invert it in photoshop also does a good job. Hey, i was just wondering, once you have inverted your x-processed slide film into photoshop, what tweaking do u do??? All my shoots have a green tinge to them. Michael any green is from not setting the white or black points when you scan. So try to do a white balance correction in PS. If it doesn't correct the green then rescan with more attention to the colour histogram. This is cross processing so don't expect perfect colours there will be shifts sometimes dramatic but an overall cast is caused by scanning it's not really part of the negative. I'm using an Epson V700. What's the method for setting the white and black points, and how can I tell what those points are? Furthermore, is there a way to apply these points to every frame in a series of batch-scanned photos? Dan I'm not sure on the V700. Black point is the darkest part of you image essentially (r,g,b) = (0,0,0) and white is the opposite, the v500 has both eye droppers and sliders.